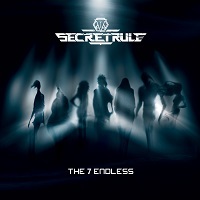 Italian metal band Secret Rule, who were formed in 2014, are to release their fourth album, ‘The 7 Endless’, on 25 January through Pride & Joy Music. This album was inspired by The Endless characters from the comic book ‘The Sandman’. As I have never read the comic book I have no idea of the story line and was interested to see if it would make any sense to me. It is difficult to describe it as a concept album as each song can stand alone and still be enjoyed. This album opens with a strong symphonic intro which blends straight in with the melodic keyboard and guitar of ‘The Endless’. Angela Di Vincenzo’s operatic style vocal slides smoothly over the strong advancing riff and powerful drums. ‘Birth’ showcases Corrente’s in your face double kicks along with the full impressive range of Di Vincenzo’s voice. Third track ‘Dream’ sees Andrea Ciccomartino (Graal) provide the male vocal, and the two voices compliment each other beautifully. It is another fast paced high energy song. The high energy continues through ‘Desire’, ‘Alone’ and ‘Destiny’. ‘Hidden In A Dream’ slightly slows the pace but the guitar and drums are still strong on this song, the higher range on Di Vincenzo’s vocals play a large part during this particular track. ‘Desperation’ brings the first hints of darkness into this story only to continue through the next few songs ‘Delirium and ‘Destruction’. On these tracks the melody is more oppressive to emphasize the despair. ‘The Awakening’ brings hope and faith to the climax of this journey. It has a slow almost folky feel to the first verse, while the chorus crescendos the power of the previous track isn’t reached. The album finished with the sound of refreshing rain. As with any story there are high and low points, and this album portrays them all. Secret Rule collaborated with a few special guests on this opus; Gabrelle Chiararo was the narrator on ‘The Endless’ and ‘Desire’, Christian Ice was the additional keyboardist and helped with arrangement for the album, Marco Roberto Capelli provided the introduction and, of course, the aforementioned Andrea Ciccomartino. On this album, the band decided to take control of everything themselves and you can tell the difference between this and their previous albums. Personally, I enjoyed this album even though as I stated previously I have no knowledge of the endless. It is a powerful and melodic metal album to me. ‘The 7 Endless’ is released next Friday (25 January). You can get your copy HERE.